Greystar submitted this illustration to the city of Menlo Park for an apartment complex at 141 Jefferson Drive. 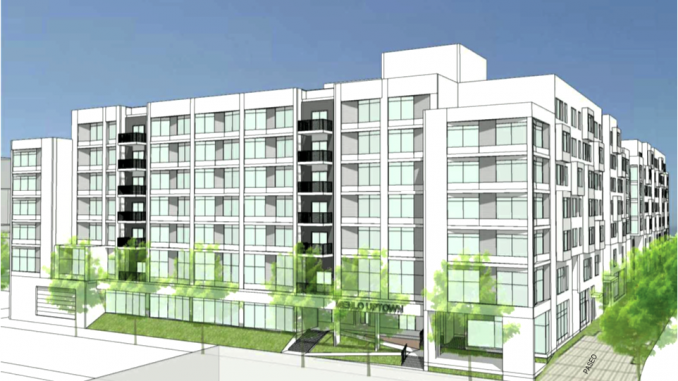 One of the nation’s largest housing developers, Greystar, is proposing to build 483 apartments and condos in Menlo Park’s east side, which would be the largest apartment complex in the city. 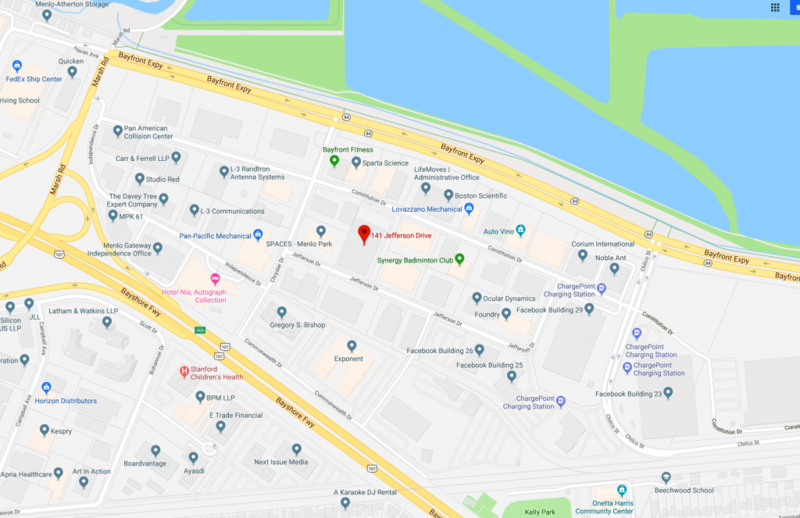 The development, to be called “Menlo Uptown,” is proposed for 4.83 acres at 141 Jefferson Drive, midway between the Hotel Nia and Facebook’s Constitution Drive campus in Menlo Park. It would replace a couple of single-story commercial buildings. The city’s biggest apartment complex is Sharon Green, with 296 units at 350 Sharon Park Drive in the Sharon Heights neighborhood. The Greenheart project at 1300 El Camino will have 183 apartments and the Stanford development at 500 El Camino will have 215 apartments. 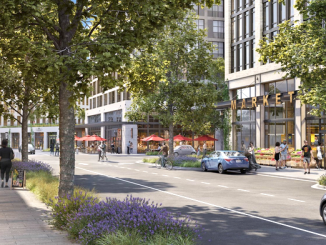 Facebook is proposing to build 1,500 apartments as part of its Willow Village project — however that project has seem to have stalled, with the last public hearing 11 months ago. This project may make a very small dent in the area’s housing-to-jobs imbalance — in June the San Mateo County Housing Leadership Council reported that for every 19 jobs that were created between 2010 and 2015, one home was built. The current look of 141 Jefferson Drive. Google photo. The city’s planning commission on Monday will be taking its first look at the project consisting of two seven-story apartment buildings and six three-story condo buildings. The project proposed to build a total of 483 new homes — 441 apartments for rent and 42 for-sale condos. The two apartment buildings will be about 85 feet tall, have two floors of above-ground parking, and five stories of apartments, with 221 in one building and 220 in the other, according to project plans. The condos will be next to the apartment building facing Constitution Drive, they will be a maximum of 39 feet tall, with 42 condos. There will be 582 parking spaces and 799 bicycle spaces provided throughout the project, according to a report by city Senior Planner Tom Smith. Greystar is also slated to include low-income homes as part of the development, according to Smith’s report. Right now the city has 65 below-market-rate homes on the books, assuming Greystar decides to include the 15% lower-income apartments or condos in the project — it will add 72 low-income homes to the city. No decisions will be made on this project come Monday. It will only be a review session. However, Smith is asking the commission to provide feedback on the design of the buildings, the proposed open space for the project (there will be walkways and a dog run throughout the project), and if the density and project itself is right for the area. • 111 Independence Drive, being developed by SP Menlo LLC, which proposes to build 94 apartments. This project is still under review by the planning department. • The Menlo Gateway project by the Bohannon Development Company, where the second and third office buildings are currently under construction at 101 to 155 Constitution Drive. • An office project at 162-164 Jefferson Drive, across the street from the proposed Greystar development. The Sobrato Organization is proposing to build 249,500 square-feet of office space, that project is under environmental review. 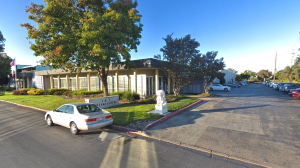 Menlo Park Planning Commission meets Monday at 7 p.m. in council chambers, 701 Laurel St.